Famous quote: "No, you are strong, senpai. It's not because of your Magic Circuit or your talent, but because your mind is pure... I knew that from the first time I met you. I knew you would never betray anyone." A student in her first year of high school, Sakura is the sister of Shinji Mato. After Shirou's father Kiritsugu died, Sakura often visited Shirou's home to help him with his daily chores. She is outwardly shy and timid, but possesses great inner strength. Sakura has a long standing and obvious crush on Shirou Emiya. Sakura is the biological sister of Rin Toosaka, and has been in the care of the Matou family for many years. Like most sorcerers, her father, Tokiomi Toosaka, only chose one daughter to carry on his family's tradition believing that raising an additional child would introduce competition. Zouken Matou, an ancient ally of the Toosaka House, offered to adopt Sakura, for his own heir, Shinji Matou, who was incapable of sorcery. In Fate/Zero, it is revealed that Kariya Matou, now Sakura's uncle, made a deal with Zouken Matou to win the Holy Grail in exchange for her freedom from Zouken and to be able to return to the Toosaka family. 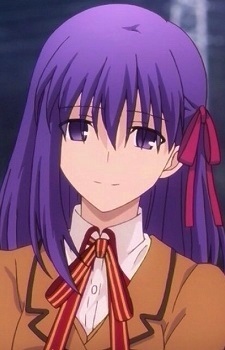 Kariya was the only member of the Matou family to love Sakura; since Kariya was a childhood friend of Aoi Toosaka (Sakura's mother), he had become well-acquainted with Sakura and her sister. He was in love with Aoi, but gave up peacefully because she seemed to be happy accepting her engagement to Tokiomi. Since he never received training as a magus (though he had more potential in comparison to Shinji's father Byakuya Matou), he has worms implanted in him to boost his circuits, and underwent accelerated training for the coming war. The worms shortened his life span and constantly weakened body since they are eating away at his magical circuits. Considering his ever weakening body and the large mana requirement required for nature of his servant, a Berserker, it is not terribly surprising that Kariya loses the 4th Grail War, possibly at the hands of his own servant. Under Matou care, Sakura is subjugated to physical and mental abuse on a daily basis. Zouken seeks to use her as one of his future vessels, empowered by the power of Angra Mainyu. Gathering the tainted fragments of the shattered grail from the last war, Zouken hybridizes the collected black ichor with several of his worm familiars. He implants these parasitic worms into Sakura's body; they drain her Mana. Sakura's plum hair and eye color are direct consequences of Zouken's worms swimming through her bloodstream. Although castigated and humiliated on a daily basis, Sakura maintains her bearings with great stoicism. She fell in love with Shirou Emiya several years ago after secretly watching him constantly attempt to jump a bar (as a track-and-field practice). His staying dedication inspires Sakura to endure her hardships, and her admiration gave her the confidence to approach and assist Shirou after he receives an injury. Shirou's growing relationship with Rin is a source of hatred and envy for Sakura, for she believes Rin to be the cause of all her torture. For the eleven years after her adoption, Sakura grew to resent Zouken for his cruelty, her father for sending her away, and finally Rin, who was unaware of her sister's suffering, for never coming to save her. Sakura is the principal Master of Rider, who was summoned several days prior to the start of the 5th Holy Grail War. However, under pressure from Shinji and the desire not to fight either Shirou or Rin, Sakura yielded her Master's right to him, although Sakura retains her original Command Mantra.